Welcome to Breathe and Play Every Day! You're brilliant! You already know you want to try 2 weeks of unlimited classes for only $39?! Look no further - click that beautiful blue button so you can get started right away! What is Breathe and Play Every Day all about? We are 2 moms who are really freaking tired and we have a love/hate relationship with parenting - we get you... we totally get you. Come hang out with us. We have coffee, yoga and funny stories. We created this space for YOU - because you deserve it! So come on in - kick off your shoes, and we'll take it from there. Growing a human is hard work! Life probably feels quite different than it used to - yoga can help you get in touch with your changing body, brain, and heart. We offer the ONLY licensed Om Births programming - that means we have the BEST instructors, the BEST classes, and the BEST workshops! Start out with the best from the very beginning. Breathe and Play Inclusive Yoga programming offers classes with a specialized approach to meeting each child where they are. Classes are welcoming, fun and engaging - and most importantly, effective. Yoga decreases stress, anxiety, and depression and increases self-awareness, compassion, and regulation. Each season offers a different focus of direct yoga instruction. Breathe and Play Yoga teaches tools and strategies that last a lifetime. Busy lives? Breathe and Play together! Quality over Quantity - make your time together count. 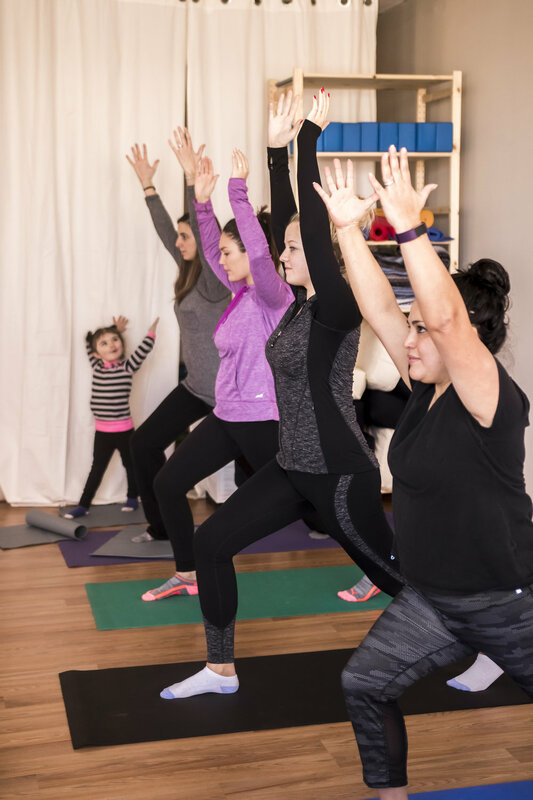 Zumbini, Family Yoga, Boyoga, Mother + Daughter yoga, and private family sessions are all fun and valuable ways to bond with each other. Ready? Bring Your Family & Let's Move! Check out our upcoming classes! If you're anything like us, you like to know what to expect. We have so much information to share! Check out our Class Description page to see what each class is all about. And if you like what you read, you can sign up right there! In addition to our regular weekely classes we also offer a variety of in-depth workshops to support the health of your family! Prenatal Partner Yoga, CPR, Sleep Seminars, and Parenting classes are just a few of the seasonal workshops we have to offer. What Does Your Membership Look like? LIKE US? This membership allows anyone in your family to attend any 5 classes in a one month period. You also receive discounts on workshops and select items from our retail selection (Barefoot Books, doTERRA, and Breathe and Play merchandise). $89/month auto-renew. LOVE US? This membership includes the works - UNLIMITED classes - we're not kidding. Yoga, yoga, and more yoga. With coffee and laughs in between. Take advantage and just go for it - no worries, no counting classes, just come as much as you'd like. You also receive discounts on workshops and anything in our retail selection (Barefoot Books, doTERRA, and Breathe and Play merchandise). $119/month auto-renew.